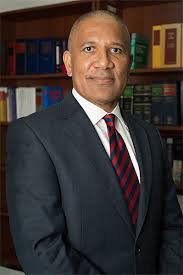 Governor John Rankin announced that, after consultation with the Chief Justice, he has appointed Mr Larry Mussenden to become a Puisne Judge of the Supreme Court. “Mr Mussenden was called to the Bar in England and Wales in 1995 and the Bermuda Bar in 1996. He served as Crown Counsel from 1996 to 2001,” the statement said. “He then moved to the Defence Bar after which he was appointed in 2004 as Attorney-General, Minister of Justice and Government Senate Leader, having been appointed as a Senator in 2003. Following a further period in private practice from 2007 to 2016 Mr Mussenden was appointed as Director of Public Prosecutions. “Mr Mussenden also served in the Royal Bermuda Regiment, retiring as a Major having reached the appointment of Second-in-Command. He was President of the Bermuda Football Association from 2001 to 2008 and 2010 to 2016 and also served as Chair of the FIFA Appeals Committee for 10 years. Governor John Rankin said “I am pleased to appoint Mr Mussenden following a recommendation of the Judicial & Legal Services Committee and after consultation with the Chief Justice. I wish to congratulate Mr. Larry Mussenden on being appointed as as Puisne Judge of the Supreme Court. I believe you were born to serve. I Thankful to know that your family raised you to be the honorable and distinguished gentleman that you are. I am very proud of you.